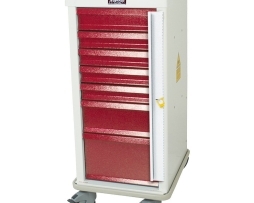 Our all Aluminum mini line is perfect for facilities with limited space. 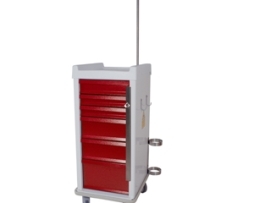 The Aluminum Mini line features light-weight Construction. 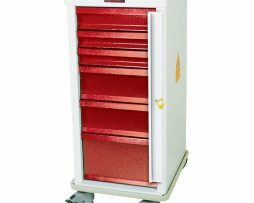 Harloff AL810B7-EMG Aluminum Seven Drawer Emergency Cart (Super Tall Cabinet), 7 Drawer, Breakaway Lock, 100 Breakaway Seals, 5-3.25″, 1-6.5″, and 1-9.75″ Drawers. Includes EMG Accessory Package: Oxygen Tank Bracket, Adjustable IV Pole, Cardiac Board, Utility Hooks (2), Adjustable Dividers in Drawer Trays 68530-P1 (2 ea.). 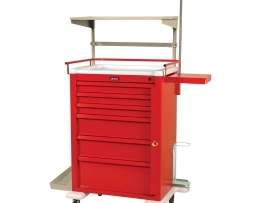 Harloff AL810B7 Aluminum Seven Drawer Emergency Cart (Super Tall Cabinet), 7 Drawer, Breakaway Lock, 100 Breakaway Seals, 5-3.25″, 1-6.5″, and 1-9.75″ Drawers. 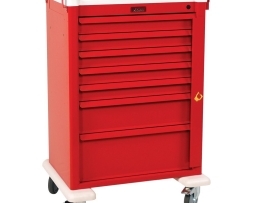 Harloff AL810B6-EMG2 Aluminum Six Drawer Emergency Cart (Super Tall Cabinet), 6 Drawer, Breakaway Lock, 100 Breakaway Seals, 3-3.25″, 2-6.5″, and 1-9.75″ Drawers. Includes EMG2 Accessory Package: Adjustable Back Shelf with Hanger Bar, Adjustable IV Pole, Oxygen Tank Bracket, Suction Shelf, Drawer Label Kit, Cardiac Board,1 ea Full Drawer Tray with Adjustable Divider set, in Drawer Trays, 4 ea 3″ Adjustable Exchange Tray with Divider Set, 2 ea 6″ Adjustable Exchange Tray with Divider Set (Equivalent to Armstrong Medical PAPE-1) Electrical Outlet Strip with Cord Wrap not included as of January 15, 2015 due to UL Specification change. 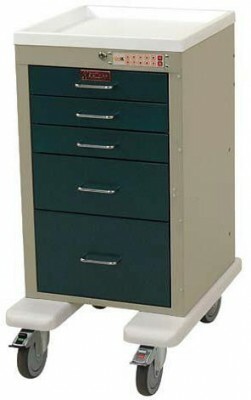 Harloff AL3245EKC Mini Line Five Drawer Treatment Procedure Cart Electronic Locking with Keypad, (Short Cabinet); 3-3″, 1-6″, 1-9″ Drawers. Includes Protective Pontoon Side Bumper and 5″ Casters. AUTOLOCKING: Drawers Automatically Re-Lock After Access: pre-set / programmed time (unlimited re-lock timing). Accessed by PIN into KeyPad (with key-lock over-ride) (6) D Batteries with a life of 1 year (minimum). 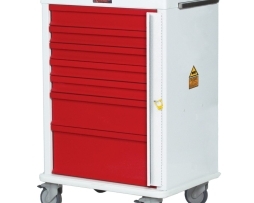 Harloff AL3256EKC Aluminum Mini Line Six Drawer Cart, ELECTRONIC Locking with Keypad, (Tall Cabinet); 3-3″, 2-6″, 1-9″ Drawers. Includes Protective Pontoon Side Bumper and 5″ Casters. AUTOLOCKING: Drawers Automatically Re-Lock After Access: pre-set / programmed time (un-limited re-lock timing). Accessed by PIN into KeyPad (with key-lock over-ride) (6) D Batteries with a life of 1 year (minimum). AUTOLOCKING: Drawers Automatically Re-Lock After Access: pre-set / programmed time (un-limited re-lock timing). Accessed by PIN into KeyPad (with key-lock over-ride) (6) D Batteries with a life of 1 year (minimum). AUTOLOCKING: Drawers Automatically Re-Lock After Access: pre-set / programmed time (un-limited re-lock timing). Accessed by PIN into KeyPad (with key-lock over-ride) (6) D Batteries with a life of 1 year (minimum). 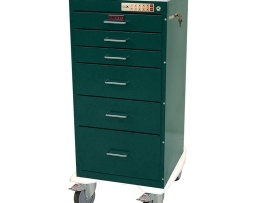 Harloff AL809E6-ANS Aluminum Six Drawer Anesthesia Cart (Super Tall Cabinet), 6 Drawer, Basic Electronic Pushbutton Lock with Key Lock Override. Factory Set User and Supervisor Code. Cabinet May be Programmed in the Field. 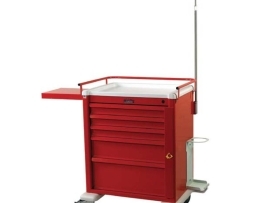 3-3.25″, 2-6.5″, and 1-9.75″ Drawers Includes ANS Accessory Package: 4 side rail/push handles, 3 Tier Back Rail System, Electrical Outlet Strip with Cord Wrap not included as of January 15, 2015 due to UL Specification change. Harloff MR7B-EMG MR-Conditional 7 Drawer Emergency Cart with 1-4″, 4-3.25″, 1-6.5″, and 1-9.75″ Drawers and Emergency Cart Accessory Package: IV Pole, (4) Utility Hooks, Cardiac Board, Oxygen Tank Holder, and (2) Full Drawer Trays with Adjustable Dividers. 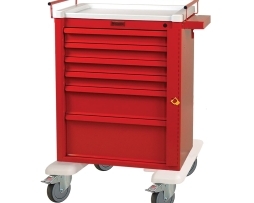 Harloff MRN6B Narrow Body MR-Conditional 6 Drawer Emergency Cart with Breakaway Lock; 1-4″, 2-3.25″, 2-6.5″, and 1-9.75″ Drawers. 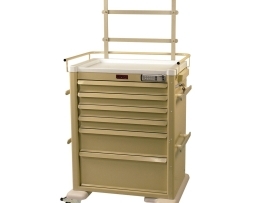 Harloff MRN6B-EMG Narrow Body MR-Conditional 6 Drawer Emergency Cart with Breakaway Lock; 1-4″, 2-3.25″, 2-6.5″, and 1-9.75″ Drawers. 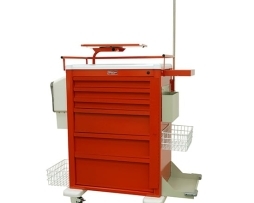 Harloff MRN7B Narrow Body MR-Conditional 7 Drawer Emergency Cart with Breakaway Lock; 1-4″, 4-3.25″, 1-6.5″, and 1-9.75″ Drawers. 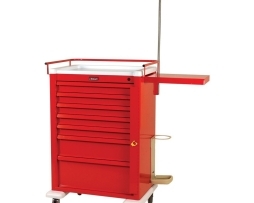 Harloff AL809B6-EMG Aluminum Six Drawer Emergency Cart (Tall Cabinet), 6 Drawer, Breakaway Lock, 4-3.25″, 1-6.5″, and 1-9.75″ Drawers. Includes EMG Accessory Package: Oxygen Tank Bracket, Adjustable IV Pole, Cardiac Board, Utility Hooks (2), Adjustable Dividers in Drawer Trays 68530-P1 (2 ea. ), 100 Breakaway Seals. 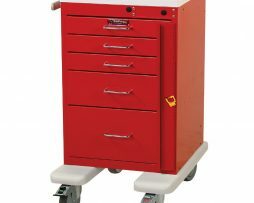 Harloff AL808B5-EMG Aluminum Universal Line Emergency Cart, (Medium Cabinet), 5 Drawer, Breakaway Lock, 3-3.25″, 1-6.5″, and 1-9.75″ Drawers. Includes EMG Accessory Package: Oxygen Tank Bracket, Adjustable IV Pole, Cardiac Board, Utility Hooks (2), Adjustable Dividers in Drawer Trays 68530-P1 (2 ea. ), 100 Breakaway Seals. 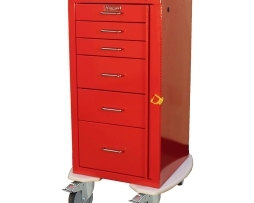 Harloff AL809B6 Aluminum Six Drawer Emergency Cart (Tall Cabinet), 6 Drawer, Breakaway Lock, 4-3.25″, 1-6.5″, and 1-9.75″ Drawers. 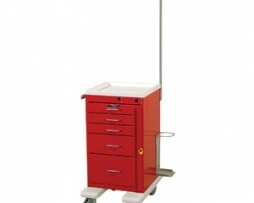 Harloff AL3256B-EMG Aluminum Mini Line Six Drawer Emergency Cart (Short Cabinet) with Breakaway Lock, 3-3″, 1-6″, 1-9″ Drawers, and Accessory Package: IV Pole, Oxygen Tank Holder, Cardiac Board, and Aluminum Push Handle. Includes plastic bumper and 5″ casters. 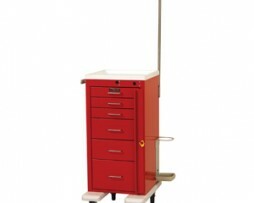 Harloff AL3245B-EMG Aluminum Mini Line Five Drawer Emergency Cart (Short Cabinet) with Breakaway Lock, 3-3″, 1-6″, 1-9″ Drawers, and Accessory Package: IV Pole, Oxygen Tank Holder, Cardiac Board, and Aluminum Push Handle. Includes plastic bumper and 5″ casters. 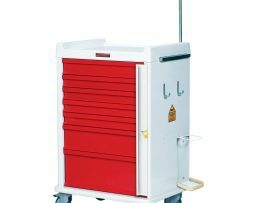 Harloff AL3256B Aluminum Mini Line Six Drawer Emergency Cart (Tall Cabinet) with Breakaway Lock; 3-3″, 2-6″, 1-9″ Drawers. Includes plastic bumper and 5″ casters. 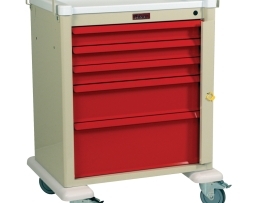 Harloff AL3245B Aluminum Mini Line Five Drawer Emergency Cart (Short Cabinet) with Breakaway Lock; 3-3″, 1-6″, 1-9″ Drawers. Includes plastic bumper and 5″ casters.